After Paris Attacks, Voltaire's 'Tolerance' Is Back In Vogue : Parallels The writer's classic 18th-century work took aim at intolerance in the Catholic Church. Now it's flying off the shelves as the French seek answers following deadly shootings by Islamic extremists. A woman looks at flowers placed near the headquarters of the magazine Charlie Hebdo in Paris, on Feb. 7. 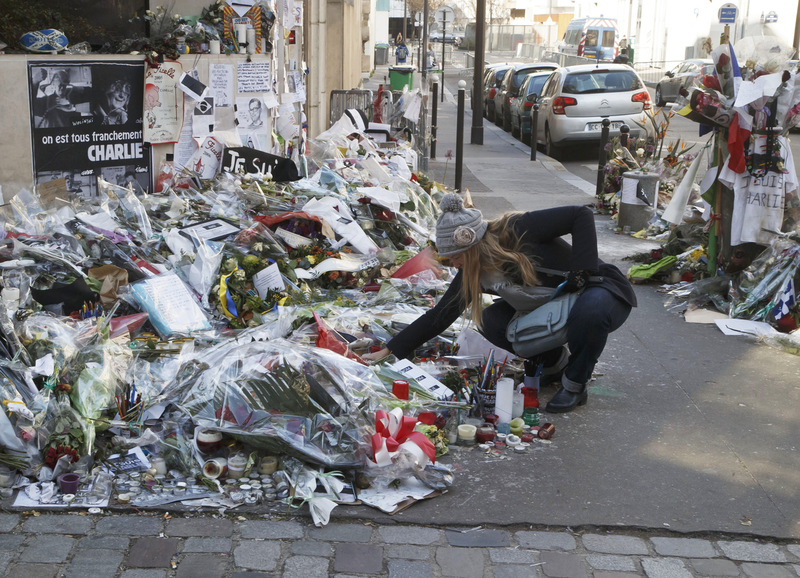 Islamist extremists stormed the offices of the satirical newspaper,Â killing 12 people in January. Like most bookshops around Paris, Emile, which caters to young readers, sold all its copies of Voltaire's Treatise on Tolerance on Jan. 8, the day after two gunmen stormed into satirical magazine Charlie Hebdo killing eight journalists. In the wake of the Paris terrorist attacks that took the lives of 20 people, Voltaire's manifesto in favor of religious tolerance — written in 1763 — is flying off the shelves. Emile employee Laurianne Ledus says she was surprised that an 18th-century manuscript could become a bestseller today. "It's really, really weird," says Ledus. "But I think it is an important book, even 200 hundred years later." 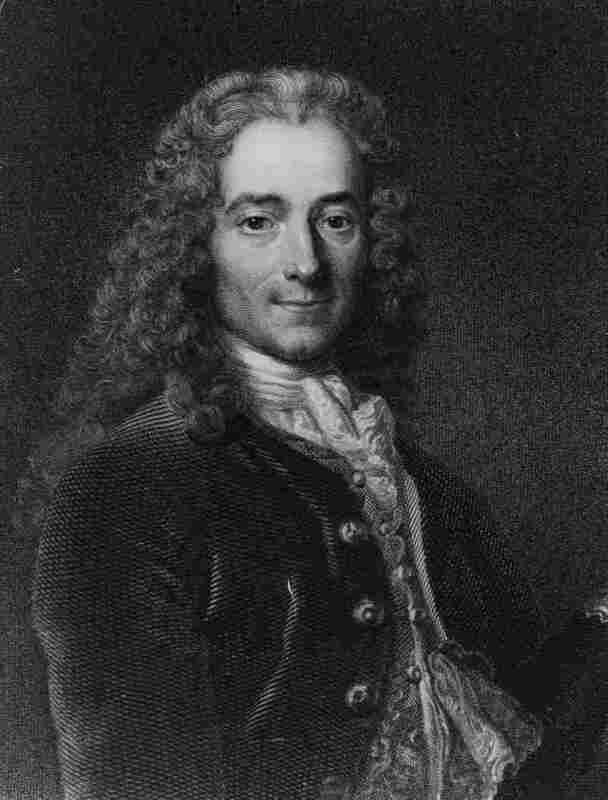 Francois-Marie Arouet, better known as Voltaire (1694-1778). The author and philosopher wrote 'Treatise on Tolerance,' on religious freedom, in 1763. It has gained a renewed readership after Islamist extremists carried out deadly attacks last month in Paris. Ledus says no one really understands why the attacks happened, and everyone is looking for answers. "Children need to understand life and events and I think parents need this book in order to explain," Ledus says. Enlightenment essayist, philosopher and historian Francois-Marie Arouet, better known by his nom de plume, Voltaire, was born in Paris in 1694. He is famous for his wit, advocacy for freedom of speech, and stinging attacks on the Catholic Church. In Voltaire's day, Protestants were persecuted and killed in France. In his book Voltaire defended the Protestants and excoriated the Catholic Church over its intolerance. As Voltaire famously wrote, "Sir, I hate what you write, but I would give my life so that you could continue writing." In the recent Paris attacks, four Jews were killed in a shooting that targeted a Kosher supermarket. And since the violence, dozens of mosques have been desecrated. Leading intellectuals have been quick to draw comparisons between Voltaire and Charlie Hebdo. The Societe Voltaire, a group that safeguards the philosopher's legacy called Voltaire the rallying symbol for those who do not accept violence in the name of religion. The publishing house Gallimard, which puts out the pocket edition of Voltaire's tolerance manifesto, says it is already on its second reprint. Nearly half as many copies have been sold in the last three weeks than in the last 12 years. Publicist Bertrand Mirande-Iriberry says the philosopher's ideas reassure. "At a time when our way of life, of being and living together has come under attack, this book is like an antidote," says Mirande-Iriberry. "It's a way of resisting." Mirande-Iriberry believes the French also turned to Voltaire because he is part of their familiar mental landscape. "When we're young, we all read Voltaire in school," he says. "And whether you read or not, if you're French, you've read Voltaire." Gibert Jeune, a bookstore that sits on Paris' busy Place St. Michel in the heart of the Latin Quarter, supplies many of the books on French school curriculums. Clerk Guillaume ElKasser says students used to come in and buy Voltaire for class. "Before the attacks, we sold Voltaire mostly for school," he says. "People didn't read him for their own pleasure. Now they are." A popular news magazine reprinted passages from the philosopher's 1763 treatise. In such somber times, said Le Nouvel Economiste, we turn to Voltaire for solace, and a reminder of our long-standing devotion to tolerance.